Edward Wakefield and Susanna Crash were the parents of several controversial sons, five of whom became prominent in the colonisation of Australia and New Zealand - Edward Gibbon, Daniel Bell, Arthur, William and Felix. British politician, theorist on colonisation and a principal founder of the colony of New Zealand. Edward Gibbon was one of the grandchildren for whom Priscilla took responsibility and cared for in their childhood; he was not an easy child. 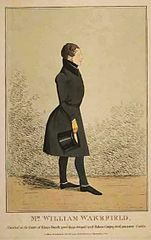 Like his father he married early eloping with the wealthy Eliza Pattle in 1816 who died young leaving two children to be brought up by their aunt. Edward's ambitions did not match his income and he almost managed to secure a wealthy heiress, 15 year old Ellen Turner, in 1826. The couple were married in Gretna Green, Scotland, and travelled to France, before Ellen's father was able to notify the authorities and intervene. The marriage was annulled by Parliament and he and his brother, William, were sentenced to three years in Newgate prison in 1827 for what became known as the Shrigley abduction (after her home village Pott Shrigley). The case attracted great public interest and ruined Wakefield's hopes of entering Parliament. Wakefield became involved in various schemes to promote the colonisation of South Australia - his scheme aiming at establishing a wealthy landlord class nearly ruined the colony by its failure. New Zealand and Canada. Karl Marx called him 'the most notable political economist of the 1830s'. Notable judge in New Zealand. As a child Daniel Bell was a 'bright' child and he showed little enthusiasm for learning. He spent some time in the home of Francis Place a social reformer who described him as lazy, sulky and disagreeable and probably dishonest but was determined to persevere with Daniel out of respect for his father. On leaving school he was apprenticed to learn book-keeping, conveyancing and practical farming, but was unsuccessful and was sent to Amsterdam to work in a merchant's office. In 1824, he eloped with Selina Elizabeth de Burgh whom he married; Selina and their son, Charles, died four years later. He married Angela Attwood in 1835 he married and obtained a law degree and practised at Lincoln's Inn. He immigrated to New Zealand alone in 1842 under an assumed name settling in Wellington where he died in 1858. The inscription on his grave: And enter not into judgment with thy servant, for in thy sight shall no man living be justified. Psalm 143. Ver. 2. Arthur joined the Royal Navy at the age of 11, before joining his brother, Edward Gibbon Wakefield, in establishing the new settlement at Nelson, New Zealand. He died in the Wairau Affray which was a huge blow to William as he felt partly responsible. William was an English colonel, the leader of the first colonising expedition to New Zealand and one of the founders of Wellington. William was also an accomplice to his brother Edward's abduction of Ellen Turner and spent three years in Newgate prison. In 1826, he eloped with Emily Elizabeth, daughter of Sir John Sidney, and they had one daughter.